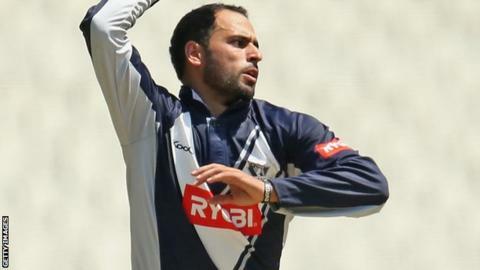 Cricket Australia is trying to fast-track the citizenship application of Pakistan-born leg-spinner Fawad Ahmed ahead of this summer's Ashes series. The 31-year-old plays for Victoria after he fled his homeland, saying he was persecuted by religious extremists. He was granted Australian residency in January and took 7-162 on his first-class debut Down Under. Full citizenship would allow him to play for Australia when the Ashes begin at Trent Bridge on 10 July. A clause in Australian law allows some athletes to have their cases brought forward - something which has been previously invoked by Olympic athletes. "We are trying our best but there must be some process," Ahmed told BBC Radio 5 live. "It will take some time, but I'm pretty hopeful it will come through quickly. "It would be a dream moment for me to play in the Ashes for Australia in England." Since the retirement of legendary leg-spinner Shane Warne in 2007, Australia have fielded 11 different spinners - with two playing just one Test before being discarded. Their lack of a quality spinner to replace Warne, who took 708 Test wickets, is undermining their chances on their current tour of India. Off-spinner Nathan Lyon was dropped after match figures of 4-244 in the first Test defeat, with his replacement Xavier Doherty returning 0-85 as India piled on 311-1 on the second day of the second Test in Hyderabad. Ahmed has made an impressive start to his career with Victoria - his 7-162 against Queensland meaning his first-class debut was the most successful by any spinner in the Sheffield Shield. Queensland captain James Hopes has labelled Ahmed "the best wrist spinner in the competition", while Cameron White, who is one of the slow bowlers used by Australia in recent years, has said the ex-Abbottabad spinner is one of the best leg-spinners in first-class cricket since Warne. Under current ICC regulations, Ahmed will be eligible to play for Australia on his existing visa after 18 August, but this would mean he would miss the first four Tests of the five-Test series in England. The return Ashes series starts in Brisbane on 21 November.